An air fryer is a wise and healthy companion in the kitchen. It could help you get those crispy and tasty kinds of food, minus all the unhealthy oil that you normally use for cooking! Whether you’re new or old to using an air fryer, there sure is a lot to learn about it for each passing day. People are born with that innate creativity. Have you seen all the videos and tutorials on what one could cook with a rice cooker? There’s a lot and some are beyond one’s imagination, right? Well here, we’ll try and reveal more to you on what different kinds of food you could cook in an air fryer. There’s an awful lot, and you’re in for some healthy and tasty recipes for the coming week! Did you know? The air fryer isn’t just for fried chicken and fries! You could actually roast, fry, grill, and bake with an air fryer! Don’t let the name fool you! This is the most common use of an air fryer. With the air fryer, you can make your favorite fried chicken and fries with all the crisp and taste that you love with it! What else can you make? You can make fish and chips, and other fried vegetables! Such as carrot chips, eggplant chips, and even some crispy sweet potatoes! Match that with your favorite dip or eat as it is! Safer - with a full cover and all safety features and programs, you don't have to worry about getting unwanted accidents in the kitchen. 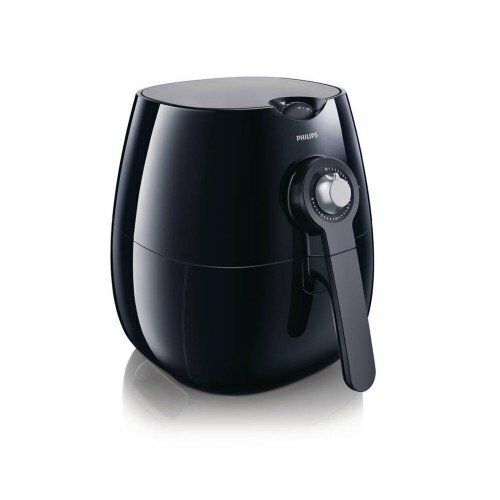 Ease of use - unlike using a pan which you often have to stand right next to it so you can control the heat, flip over the food, etc, an air fryer do things on its own. Much more healthy - Using an air fryer requires much less oil, and even drain the remaining oil when the cooking is finished. This has to be one of the loveliest surprises that I’ve unraveled from the internet. You could actually bake with an air fryer! You can now start thinking of your favorite muffin, cupcake, and moist cake flavors. There are dozens of recipes online! It’s easy. Simply mix the ingredients in a separate bowl, place them in little bun cases (for cupcakes and muffins), and place them in the air fryer! You’ll have it ready in less than 10 mins! Coat your meat or food of choice with your favorite spices, or marinate it for hours in your favorite recipe, and grill or roast it with your air fryer. The advantages? Unlike grilling, you won’t have to flip it over a couple of times, and it has a cover so your face doesn’t have to endure all that heat! An air fryer also roasts faster than your oven. Having a sumptuous dinner hasn’t been this easy! An air fryer could just do so much. In the end, try the most common and basic recipes online and then, here comes the most interesting part: let your imagination be your limits! Just make sure to review on your air fryer’s manual for some major do’s and don’ts. ​With these information in mind, cook whatever taste you’d like to have on top of your taste buds! Maximize your air fryer’s use and enjoy your healthy companion’s finish products! Just imagining all these make us go hungry! Time to get to the kitchen now and start unraveling all the wonders that your air fryer can do!" If you don’t have one yet, having one could be the perfect gift for yourself this year. Philips is a well-known manufacturer of air fryers. One of the top rated Philip’s models is Calorie Cruncher. This model is available at a very reasonable rate and supports some incredible features in this price range. This model comes with temperature and time control, 2.2 cooking capacity and weights only 7 Kg, which makes it easy for the user to easily move the appliance from one place to another. 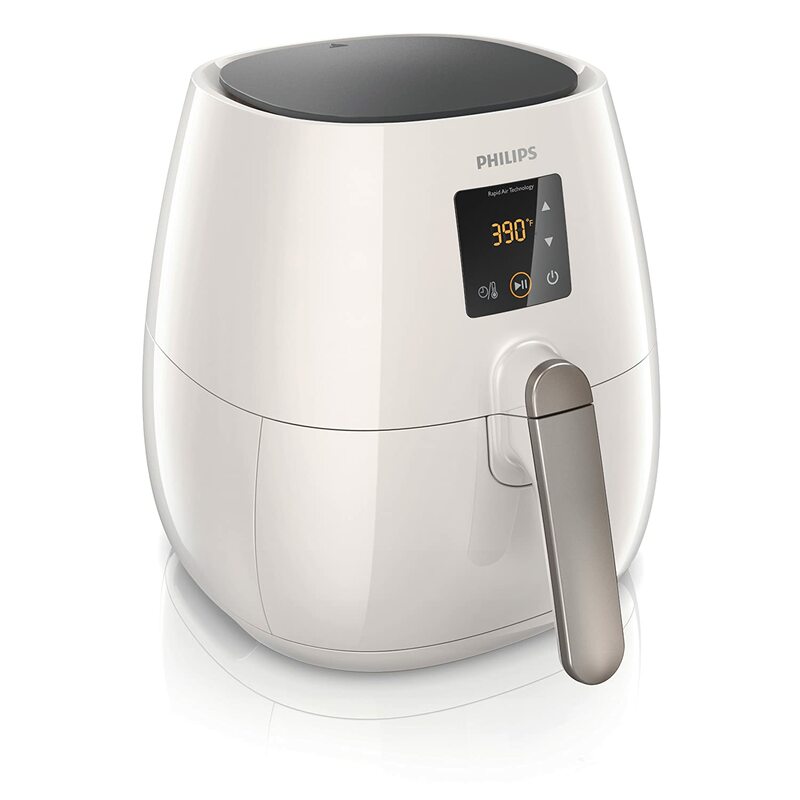 Let’s have a look at the Philips Calorie Cruncher air fryer review. This model is quite easy to operate as it comes with two knobs for controlling the time and temperature level. Even a child can easily operate this appliance, which makes it one of the popular models currently available. The temperature control allows the user to set temperature up to 200 degrees, which allows the user to cook different dishes. As soon as you the appliance achieve the temperature level set by the user, the LED light will turn green from red. Moreover, you can also open the food tray while cooking food in order to stir or flip the food. One of the major reasons behind the massive popularity of Philips air fryer models is the use of Rapid Air Circulation technology. This model also supports this advanced technology for cooking, which reduces the amount of oil. Since this model also supports rapid air circulation technology, the hot air is circulated around the food tray which is responsible for providing the appropriate amount of heat required to cook food. Moreover, this appliance does not generate any smell or smoke as hot air is being used for cooking food. 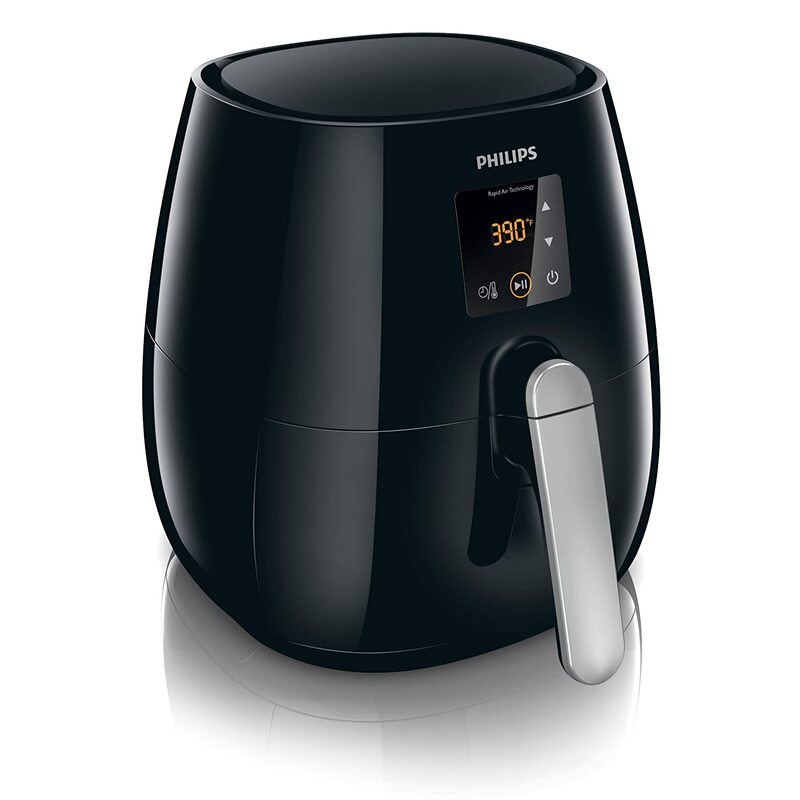 This model is highly appreciated by the users and as a result, it has gained a positive air fryer review. This model is best for cooking different food dishes and that too with no use of oil. You can easily cook potato fingers, French fries and other popular fried dishes without using even a tablespoon of oil. The best part about this appliance is that it makes no compromise in the crispness and taste of fried dishes, even without using a tablespoon of oil. Apart from cooking fried food dishes, this model can also be used for baking cakes, cooking meats and other food dishes. These are some of the major reasons behind the stupendous success of this appliance. So, now let’s have a look at some of the powerful features supported by this appliance. This model can be used for frying, baking, grilling and roasting purposes, which allows the user to eat delicious and tasty food. This model comes with a food operator that allows the user to cook two different dishes simultaneously. So, now you can easily cook two different dishes in a quick time, which saves you a lot of time. These are some of the incredible features supported by this appliance. Overall, this model is an excellent option for cooking healthy and delicious food. Everyone is busy in appraising Philips air fryers as it helps in cooking healthy and delicious food in a short period of time. However, there are few air fryer disadvantages, which must be in the knowledge of every person before he decides to make a purchase. ​Philips Air Fryers may be considered the best in its line of Air fryer brands, however, it also may not be the best for everyone." Since Philips air fryers do not use any oil for cooking, the food prepared is quite healthier. Because of this feature, a common question has been raised in several people’s minds about the taste of fry food dishes as no oil is being used for cooking. Only a few people were completely satisfied with the taste as most of the people do not find the food taste too tasty as they found the fried food dishes too dry. So, if you do not want to make any compromise with your health, then only purchase Philips models otherwise shift to other models. You always look out for a kitchen appliance that can be easily placed in the kitchen. This cooking appliance is quite bulky in size, which makes it difficult for the people to manage additional space in the kitchen. However, if you have a small kitchen space, then look for different models with small size that can be easily placed on the counter top. Philips air fryers are highly appreciated all over the world because of their tremendous performance. With such superb performance, the price level is also high as compared to the other brands. 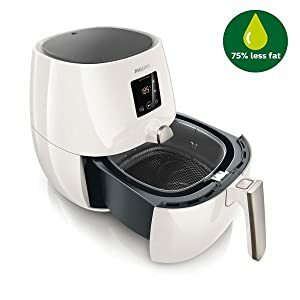 Philips basic air fryer model is priced the same as the top models of some other brands, which clearly shows that you need to empty your pockets to buy an elite Philips air fryer model. Philips air fryers run on electricity and without the electrical power, this appliance is of no use. No matter whether you live in a city or a town, you need to deal with frequent power cuts. If you do not have an electricity power for most of the time and you are dependent on this kitchen appliance for food, then you need to face some serious issues. Other brands are far better than Philips in this aspect, as they have released some models that run on electricity as well as batteries. So, unless you do not have power backups, such as inverters, you should prefer other air fryers brands over Philips models. Air fryers are well known for their multi-functional use as it can be used for baking, grilling, roasting and many other purposes. 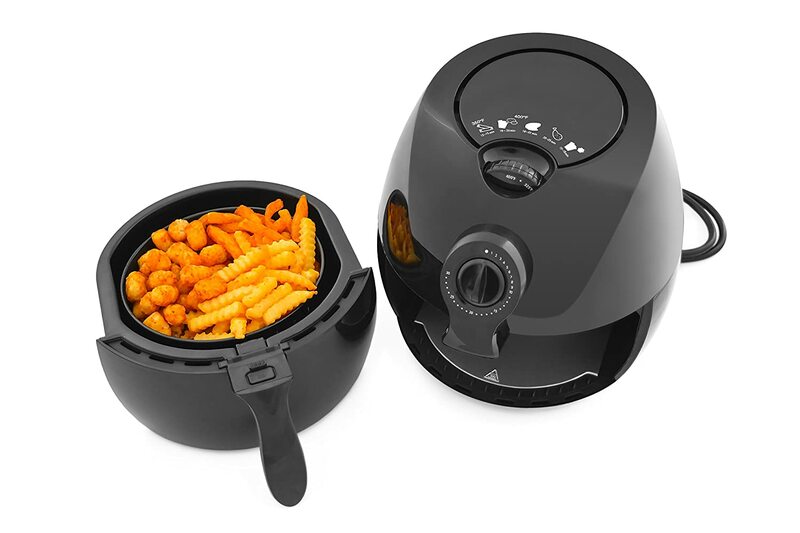 However, Philips air fryers are not able to perform well in multi functioning as they are only known for preparing fried snacks only. These are some of the major Philips air fryer disadvantages, which question its top quality performance. So, you may need to look for other air fryers brands as they might not be as reputed as Philips models, but has minimal flaws. Taste produced is not satisfying for everyone. Oversize which trouble your kitchen space management. ​The price is the highest among other air fryer brands. ​Electricity powered only, which is rather inconvenient. Can not replace all other kitchen appliances' jobs.